Nice screen shots and details in this post! If you do get stuck having capacity in your report of this style, (the directors here swear by it) then you can always add a handy little macro to redraw that capacity line. I outlined the steps for this in my similar post (using a sql query instead of PowerPivot, becase that’s how I roll!) so I thought I would share. It basically triggers when you use the slicers or refresh the data, and keeps that line happy. Cool solution, thanks for describing it! 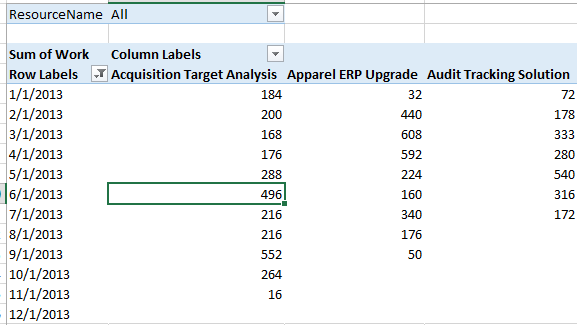 But I think I found a solution without the hack, using PowerPivot, oData and a macro to format Capacity as a stacked area and Work as stacked bars. I’ll send you the Excel sheet I created and hopefully you can check out the PP model without connecting to the website of my customer. May you help me, I’m not able to get the capacity project in the report even following your recommendations? 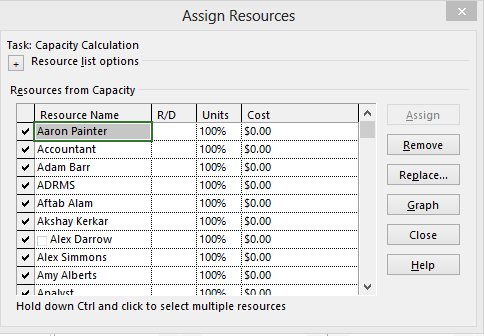 OK, Got it, I forgot to create THE capacity project with fake assignments. 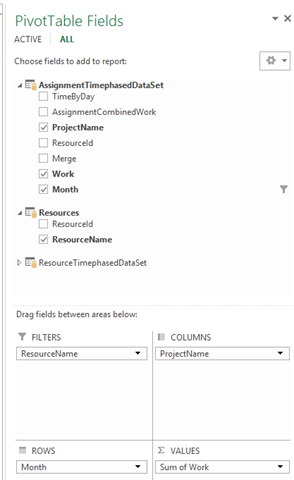 Instead of the Capacity hack use the ResourceTimephasedData odata feed to create the overall resource capacity by day (month/qtr)? 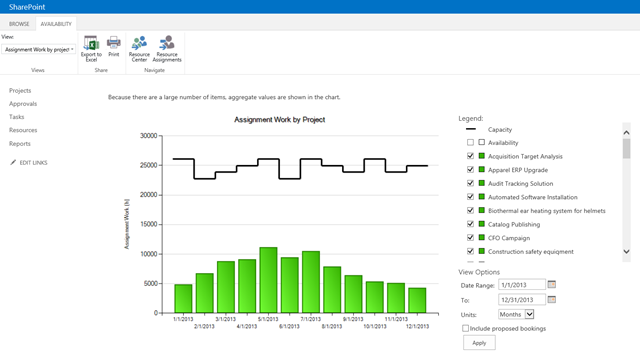 Then you will have a very similar equivalent to the Resource Center graph without the extra hoops. Good point. Can’t remember if I looked at that and rejected it…..or didn’t even look at it. Interesting post. 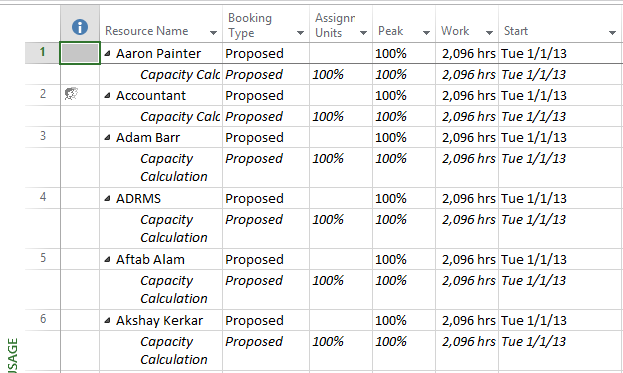 Is there any way to pull resource calendar exceptions into the capacity calculation. 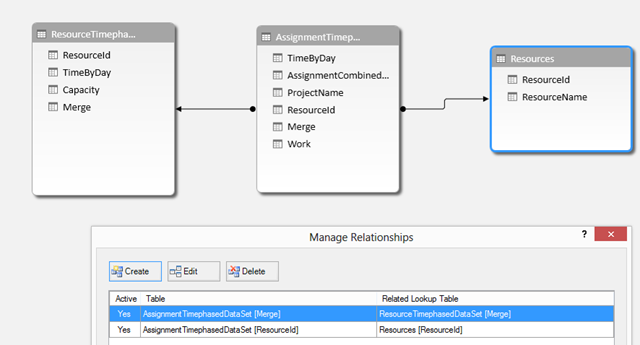 I’m trying to figure out a way to recreate the resource capacity data which takes into account resources vacation time.